CSR is becoming more mainstream as forward-thinking companies embed sustainability into the core of their business operations to create shared value for business and society. Corporate social responsibility is a form of corporate self-regulation integrated into a business model. CSR policy functions as a self-regulatory mechanism whereby a business monitors and ensures its active compliance with the spirit of the law, ethical standards and national or international norms. With some models, a firm’s implementation of CSR goes beyond compliance and engages in “actions that appear to further some social good, beyond the interests of the firm and that which is required by law. The aim is to increase long-term profits and shareholder trust through positive public relations and high ethical standards to reduce business and legal risk by taking responsibility for corporate actions. CSR strategies encourage the company to make a positive impact on the environment and stakeholders including consumers, employees, investors, communities, and others. Through economic development enterprises also develops social development, specifically social responsibility so presented four-component definition quite explicitly shows the multilateral nature of corporate social responsibility. Economic responsibility refers to society’s expectations that organizations produce goods and services that are needed and desired by clients and sell those goods and services at a reasonable price. Legal liability refers to expectations, organizations operate in accordance with the laws that govern the issues of good governance and respect for competition in the market, including legislation on protection products, consumer protection, and environmental laws and employment . 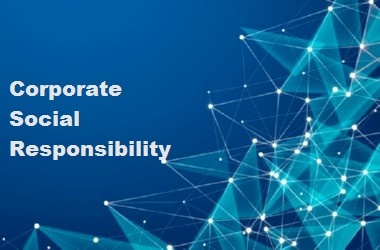 Ethical responsibility is about the social expectations for companies to do more than the law requires, or do special efforts aimed at anticipating and satisfying the social norms in terms of implementation of all business functions and activities in a fair and equitable manner. Discretionary social responsibility corporations refers to any voluntary act by companies intended to benefit the community. Discretionary social responsibility may also be the result of a concerted effort to better a place or situation that affects the society at large. This can include things such as philanthropic support programs that benefit the community, society or nation. It also may include providing technical expertise for achieving higher common or social goals. Governance: the existence of clear management principles and managing ethical behavior towards employees, transparency and accountability in business processes, avoiding actions that would cause a conflict of interest, respect the internal regulation and laws. Risk Management: upholding the principles of health and safety, product safety, consumer protection, application of responsible business practices vkluchuvanjnje stakeholders, building maintenance reputation. Value chain – responsible procurement network management vendors and Analysis of suppliers, feedback from suppliers, fair trade. Social: human rights, community engagement, philanthropic activities, charitable donations volunteerism, social benefits, building local capacity, investing in CONSTRUCTION good relations and coexistence. Satisfaction of employees at work, achieving a balance between social activities and work, fostering internal culture (transparency), job security, remuneration, diversity at work, equal opportunities for employees, training opportunities and career advancement. INVESTMENT IN COMMUNITY-Contribution of the enterprise in the development community that will lead to improving the quality of life of the population. However you reaffirm that socially responsible practices are primarily investing in the functions of the company, and those investment processes reliably and wear profits, value, reputation, stability, growth and long-term sustainability of the company. BCM invite you to contact us in order to help you in development of about socially responsible practices in your company. Because it’s no longer a question of if companies should engage in [corporate social responsibility. It’s now a question of to what extent will they do so, and how will they create and communicate real and meaningful impact.